Within the word kindness is the word kin. “Kin” means there is a relationship between people, indicating a group is made up of the same kind. Kin is the word to use when you want to describe people who are connected. 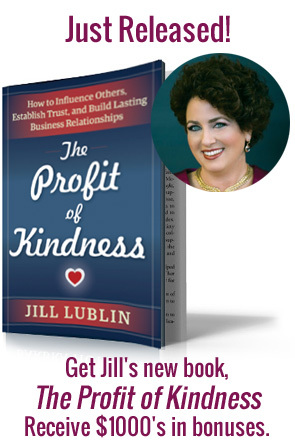 In business, you can’t have kindness without connection, or connection without kindness. The fact is we are kindred spirits in business. However, connecting in the business world is very different than the manner by which we connect in our personal lives. For the most part, in our personal lives we have the freedom to choose our friends, to identify ourselves through familial bonds, and join groups with people who share our hobbies and interests. When it comes to business, we are well aware that we can’t dismiss colleagues or kick clients out, tell off the boss or choose our cubicle mates. We can choose our friends outside the office, but in the office we get what we get. We can’t click with everyone, so in some instances we might need to learn strategies to help us get along, and there are ways to enjoy some very rewarding connections with our business cohorts, even if we don’t particularly like them. For instance, we can connect simply based on the fact that we are invested in the mission of the same business or that we have a passion for our chosen domain. No matter what, connection is vital in business and comes in many forms. The people who get ahead know how to understand others. They are usually quite compassionate and empathetic to the plights of others, giving them the ability to really get to know and even anticipate another person’s motivations, thoughts, and actions. And what research has revealed about compassion and empathy in the workplace is that people enjoy it and relish in it, and are fueled to act similarly toward others. Beyond connection fostered through compassion and empathy, we can connect in a number of ways. We connect with a company’s mission and brand, and hope to attract customers and staff who are also strongly connected, or engaged, with what we stand to accomplish. Connection also happens in the workplace, between colleagues, departments, and vendors, which establishes a common purpose and loyalty, even if everybody can’t be best friends. Additionally, an engaged workforce is directly linked with a positive customer experience: driving sales and revenue, improving the reputation of a company, and increasing performance. Then there is the all-powerful connection with our customers. Even if we never meet our customers personally, we can connect with them by intimately knowing who they are, investigating what they need, observing how they change and behave, and asking the right questions in order to ensure our business stays relevant and provides quality and satisfaction. Last but not least is our professional network and how we connect with other entrepreneurs and business leaders in order to extend our networks and gain prospects, new opportunities, and industry support. in 2000, and today add hundreds of new members monthly and produce more than 1,500 women’s business events annually through 118 U.S. and Canadian chapters. In fact, the organization is the largest women’s business event company in the world. Sandra and Kym know that connection through a dynamic community of women business owners and professionals is the most effective way to promote one’s knowledge, talents, products, and services. The connections for which the eWomenNetwork has been responsible due to its core values has not only connected professionals to one another, to prospects, and to clients, they have connected nonprofits to funding. Through their generosity and philanthropic spirit, eWomenNetwork has given more than 100 cash grants to small but important nonprofit organizations that wouldn’t otherwise get noticed to receive funding. One of their mottos is “Lift as You Climb,” and this philosophy is embodied in the scholarships and mentoring young emerging leaders receive. The mentoring is truly magical; older women act as wings of support, lifting the younger women as they climb. We all want to make money, but we need to be good people first. When you establish a vibe of emotional connection it drives people to your business. Eva Sheryl on What Do Teamwork and David Letterman Have in Common? Gary Stein@ Printing Companies on Goals, Intentions, and Strategies to …Get Noticed!